History of Dance 0 Edition History of Dance: An Interactive Arts Approach provides an in-depth look at dance from the dawn of time through the 20th century. Using an investigative approach, this book presents the who, what, when, where, why, and how of dance history in relation to other arts and to historical, political, and social events. In so doing, this text provides a number of ways to create, perceive, and respond to the history of dance through integrated arts and technology. This study of dancers, dances, and dance works within an interactive arts, culture, and technology environment is supported by the National Standards in dance, arts education, social studies, and technology education.History of Dance: An Interactive Arts Approach has four parts. Part I explains the tools used to capture dance from the past. Part II begins a chronological study of dance, beginning with its origins and moving through ancient civilizations and the Middle Ages through the Renaissance. Part III covers dance from the 17th to the 20th century, including dance at court, dance from court to theater, romantic to classical ballet, and dance in the United States. Part IV focuses on 20th-century American dance, highlighting influences on American ballet and modern dance as it emerged, matured, and evolved during that century. History of Dance: An Interactive Arts Approach includes the following features:-Chapter outlines that present topics covered in each chapter-Opening scenarios to set the scene and introduce each time period-Explorations of dancers, choreographers, and other personalities-Explorations of the dances and significant choreography and dance literature of each time period-History Highlight boxes containing unusual facts, events, and details to bring history to life -History Trivia, providing insights into how dance relates to the history, art, and society of the time period-Web sites to encourage further exploration -Developing a Deeper Perspective sections that encourage students to use visual or aesthetic scanning, learn and perform period dances, observe and write performance reports, develop research projects and WebQuests (Internet-based research projects), and participate in other learning activities -Vocabulary terms at the end of each chapterEach chapter in parts II through IV provides an overview of the time period, including a time capsule and a historical and societal overview. Each chapter focuses on major dancers, choreographers, and personalities; dances of the period, including dance forms, dance designs, accompaniment, costuming, and performing spaces; and significant dance works and dance literature. 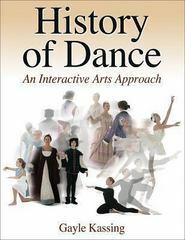 The chapters also feature a series of eight experiential learning activities that help students dig deeper into the history of dance, dancers, and significant dance works and literature. These activities are presented as reproducible templates that include perceiving, creating, performing, writing, and presenting oral activities infused with technology. Teachers can use these activities as optional chapter assignments or as extended projects to help apply the information and to use technology and other integrated arts sources to make the history of dance more meaningful.History of Dance is an indispensable text for dance students who want to learn the history of dance and its relationship to other arts of the times using today's interactive technology.